Kurdistan Regional Government Deputy Prime Minister, Qubad Talabani received Ms. Marie-Claude Bibeau, Canadian Minister of International Development and her accompanying delegation. At the meeting, attended by Falah Mustafa, Head of the Department of Foreign Relations, Deputy Prime Minister Talabani expressed his government’s appreciation to the Canadian government for its support to the Kurdistan Region, particularly during the war against the so-called Islamic State terrorist group, ISIS. He briefed the visiting delegation about KRG’s policy of reform that is being adopted recently in various sectors of the government institutions to overcome the financial crisis. Regarding the war against ISIS, Deputy Prime Minister Talabani discussed the recent victories marked against the so-called Islamic State terrorist group in Mosul. He also pointed out that the political mistakes which have contributed to the emergence of ISIS in Iraq should be addressed. He stressed that the Iraqi Federal Government should take serious steps to adopt a comprehensive reconciliation plan and include the Sunni Arabs in the political and decision-making process. While expressing appreciation for the assistance the Canadian government offered in the war against ISIS, the Head of KRG Department of Foreign Relations, Falah Mustafa stressed the importance of strengthening the relations between Canada and the Kurdistan Region. Minister Bibeau commended the measures taken by the KRG to overcome the difficulties the Kurdistan Region faces, particularly the policy of reform, helping among others to ease the current financial hardship. She stressed on further cooperation between the two sides that would help the KRG to benefit from Canadian government’s experience and expertise. She also discussed and commended KRG’s measures to protect human rights, empower women and gender equality. She expressed her government’s willingness to help the KRG in training its staff in these domains. Erbil, Kurdistan Region, Iraq (cabinet.gov.krd) – Kurdistan Regional Government Prime Minister Nechirvan Barzani met with a congressional delegation from the United States, headed by Representative Joe Wilson. In the meeting, attended by Kurdistan Regional Government Deputy Prime Minister Qubad Talabani and a number of KRG senior officials, Congressman Wilson commended the progress made by Kurdistan military forces, the Peshmerga, in the fight against the so-called Islamic State terror group. The U.S. lawmaker also reiterated his countries support to the Kurdistan Region. Prime Minister Barzani expressed his appreciation to the United States and the US-led international coalition forces for the assistance provided for the Kurdistan Region in the fight against terror. On the relations between the Kurdistan Region and the Iraqi Government, Prime Minister Barzani said while there is a good military cooperation between Erbil and Baghdad, no serious progress has been made in other fields, especially in terms of finding permanent solutions for disputed issues. 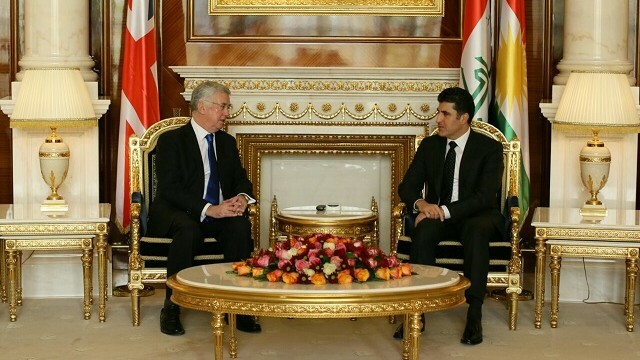 He reaffirmed KRG’s longstanding position to settle the outstanding issues through dialogue and mutual understanding. 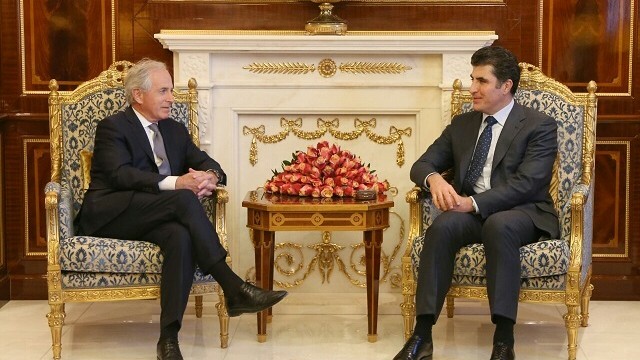 Kurdistan Region Prime Minister Nechirvan Barzani received Senator Robert Corker, chairman of the U.S. Senate Foreign Relations Committee, accompanied by a military and diplomatic delegation. In the meeting, attended by Kurdistan Regional Government Deputy Prime Minister, Qubad Talabani and a number of KRG senior officials, Mr. Corker commended the level of cooperation between Kurdistan Region military forces, the Peshmerga, and the Iraqi army in the battle to liberate Mosul and its environs. He stressed the need for such cooperation to include other fields as well, emphasizing the key role of the Kurdistan Region in achieving a general reconciliation in Iraq. Senator Corker also expressed his country’s support for the settlement of all the outstanding issues between Erbil and Baghdad. Prime Minister Barzani expressed his gratitude for the assistance provided by the United States and the international coalition in general to the Kurdistan Region. While expressing satisfaction at the level of cooperation between Baghdad and Erbil at the military level, Prime Minister Barzani pointed out that no serious progress has been made in cooperation in other areas. He stressed KRG’s willingness to settle the outstanding issues between the two sides through dialogue and mutual understanding. He also highlighted the need to set a general reconciliation plan which has so far not been discussed in Baghdad. Prime Minister Barzani also briefed the visiting delegation about the financial crisis in the Kurdistan Region, and the measures taken by the government to ease its severity. 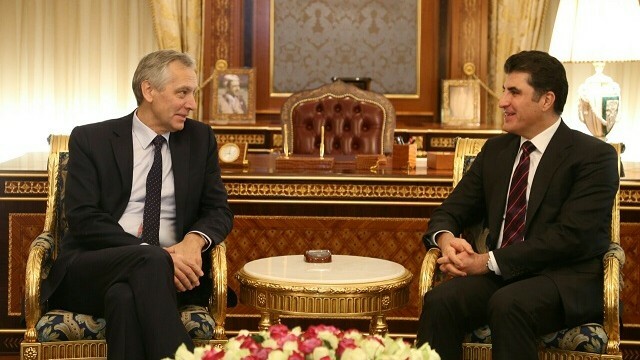 Kurdistan Regional Government Prime Minister Nechirvan Barzani received Mr. Ján Figel, Special Envoy for the promotion of freedom of religion or belief outside the European Union, and his accompanying delegation. The delegation appreciated the peaceful religious coexistence that prevails in the Kurdistan Region, stressing their support and hope for its expansion throughout Iraq. They commended the Kurdistan Region for sheltering and assisting a very large number of refugees from Syria and internally displaced Iraqis who fled ISIS’ atrocities. Pointing out that peaceful coexistence is inherent in Kurdistan’s culture, Prime Minister Barzani stated that the leadership has been constantly working for Kurdistan to become a factor of stability. He deemed it important that all sides promote stability and coexistence, inspired by Kurdistan’s experience as a model for the larger region in Middle East. Prime Minister Barzani expressed his sorrow for the fact that ethnic and religious cleansing campaigns continue to occur in some places. He hoped that the post-ISIS era will be marked by an effective comprehensive reconciliation campaign, return of the internally displaced people to their places of origin, along with the introduction of a culture of peaceful coexistence, with its responsibilities, into education programmes. Kurdistan Regional Government Prime Minister Nechirvan Barzani received Germany’s Federal Minister of Economic Cooperation and Development, Mr. Gerd Müller, along with the head of the German Green Party and the Vice President of the Bundestag, Ms. Claudia Roth. In the meeting attended by Deputy Prime Minister Qubad Talabani and a number of KRG senior officials, the visiting delegation commended the Kurdistan Region for having been able to prevail over a number of hard challenges in the past two years, including the war against the Islamic State terrorist organisation, ISIS, accommodating and assisting close to two million refugees and internally displaced people, and facing a hard financial crisis. Highlighting the military cooperation between the Kurdistan Region Peshmerga military force and the Iraqi army in the Mosul liberation operation, the delegation reaffirmed that Germany will continue its military and humanitarian support. Mr. Müller stressed his country’s willingness to contribute to the reconstruction of the war-torn liberated areas, and helping IDPs return to their places of origin. While expressing her appreciation for the assistance offered to the IDPs regardless their ethnic or religious origin, Ms. Claudia Roth raised questions regarding relations between Erbil and Baghdad. Prime Minister Barzani thanked the German Government for its military and humanitarian support to the Kurdistan Region. Regarding the relations between Erbil and Baghdad, he stressed that despite a productive military cooperation between the Peshmerga forces and the Iraqi army in the Mosul operations, Baghdad has not provided humanitarian assistance, even though injured Iraqi soldiers are treated in Kurdistan’s hospitals. Deputy Prime Minister Talabani briefed the visiting delegation on the economic difficulties caused by Baghdad’s withholding Kurdistan’s share in the Iraqi federal budget. While hoping for a better economic situation in 2017, he stressed that Germany could play a role in helping the Region to overcome its economic hardship. Kurdistan Regional Government Prime Minister Nechirvan Barzani met with Italian Defense Minister Roberta Pinotti in Erbil. In the meeting, attended by Deputy Prime Minister Qubad Talabani, Minister Pinotti commended the Kurdistan Region and its military force, the Peshmergas, for their fight against the so-called Islamic State terrorist organization. She reaffirmed her country’s support to the Peshmerga forces, including providing military training and medical treatment for the wounded Peshmergas. Prime Minister Barzani thanked the people and government of Italy for their support to the Kurdistan Region and expressed his hope for continued cooperation between the two sides, even after the defeat of ISIS. This was Minister Pinotti’s third visit to the Kurdistan Region as the Defense Minister of Italy.